You can celebrate the holidays with Venom this year in a new Yule log video. The symbiote can be seen guzzling an infinite amount of coffee in the video loop, which is 10 hours long. Yes, ten hours of a cartoon version of the symbiote getting buzzed from caffeine. Sony is currently celebrating the fact that the movie is now out on Blu-ray and digital formats and they want you to use their Yule log video at all of your holiday parties this year. The latest Yuletide video comes right after we saw the release of an epic Home Alone Yule Log. In that particular loop, which is only two hours, features Harry from the Wet Bandits getting his head torched on a continuous loop and it's great. It might even be better than watching the symbiote drinking coffee, it all just depends on your opinion of the matter. But, Home Alone is known as one of the greatest holiday movies of all time, so it has a slight edge over Venom. Venom was always going to do pretty well at the box office, but some early negative reviews kept it from getting as big as the studio would have liked in North America. However, the studio ended up extending its theatrical run when it was released in China due to the amazing amount of money that it was making. Thanks to China, Venom outpaced Wonder Woman, Ant-Man and the Wasp, and Deadpool 2, becoming one of the biggest movies of 2018 in the process. The Marvel movie is currently the fifth highest grossing movie of the year, thanks to that massive debut in China. Some comic book fans were thrown off by the humor in Venom, while others embraced it. Tom Hardy and the symbiote are actually funny in the movie, which is a pretty impressive feat. Now that the movie has done so well, fans are hoping that the sequel, which was recently announced, will be even better since Carnage will be involved this time around. Woody Harrelson and Hardy should be able to make something pretty special together, with the possibility of even more laughs as the two fight to the death. While Carnage is really exciting for the Venom sequel, it has also been hinted that Spider-Man will show up. Fans were hoping that Tom Holland was going to make an appearance in the first installment, but he was nowhere to be found. Holland, Tom Hardy, and Woody Harrelson would make for a very interesting combo that would blow doors off the box office, possibly even outdoing the success of the original. We'll just have to wait and see what happens when the sequel is officially announced by the studio in the near future. 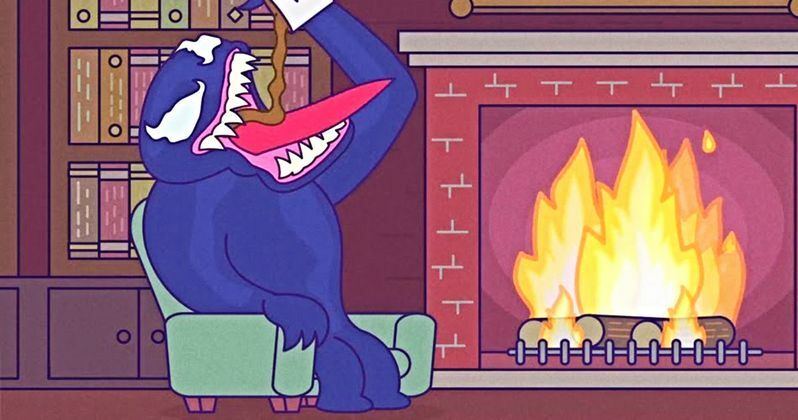 For now, you can cozy up next to the fire with the symbiote and watch him guzzle coffee for 10-straight hours thanks to the Sony Pictures Entertainment YouTube channel.